We're in the final throws of the Diamond Jubilee celebratory month so I thought it might be a good idea to revisit the Elizabethan theme once more. 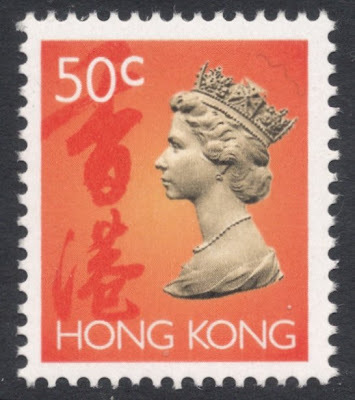 That way I can also come good on my promise to show some Hong Kong QEII stamps! For those who are looking for some QEII to collect, but won't want to go down the well-trodden paths of the Wildings and the Machins, there's solace to be found in Hong Kong. 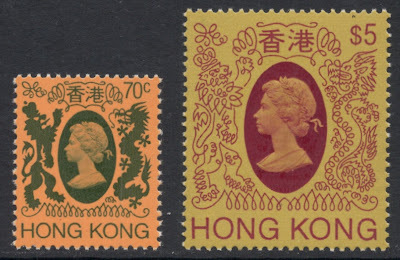 From the early days of the Queen's reign up to the end of British rule in 1997, Hong Kong issued some wonderful QEII sets, which are all interesting enough to collect and even specialise in. So here's a little recap of what's on offer. It must be said that the start was not really that interesting. 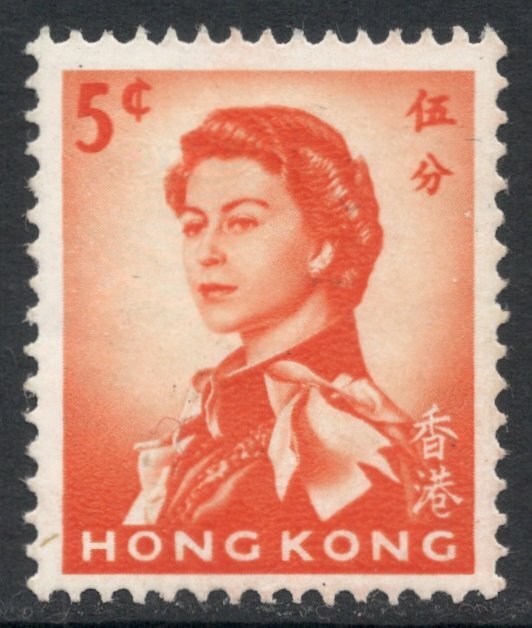 In 1954, the first QEII definitive design was introduced, including a Wilding profile head. 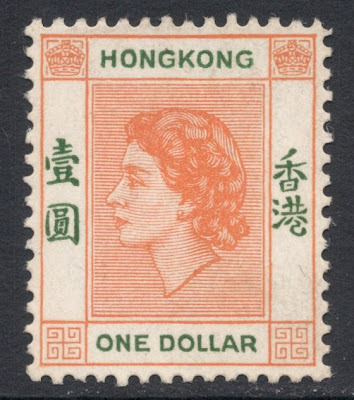 The design was similar to the previous Hong Kong definitives for King George VI, which is nice if you like continuation, but not half as spectacular as some of its successors. So we move on swiftly to the next set, introduced in 1962, based on the famous Annigoni portrait. A massive leap forward as far as originality and beauty is concerned. That set was dealt with in a previous blog post which you can find here, so again we'll leave that one for what it is. So what about the next one, then? 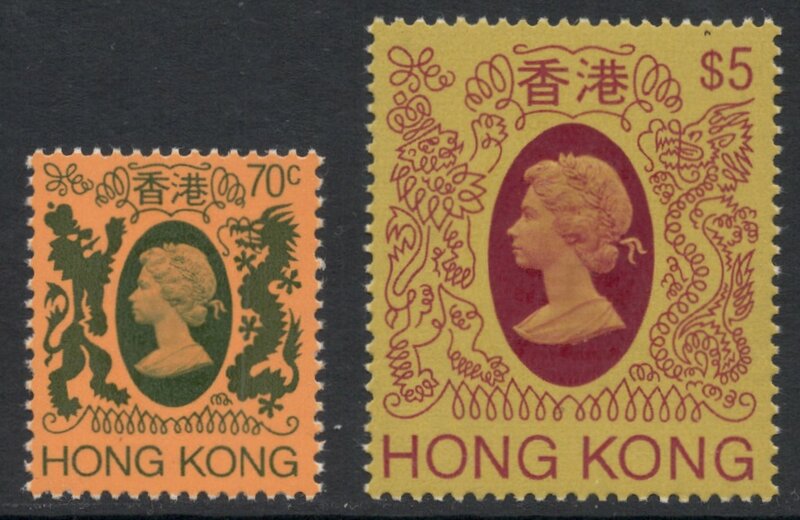 Based on a Machin head with a nice floral band on the left, again Hong Kong managed to come up with something truly original in 1973. And within three years there were three different sets to collect: two different watermarks and a final set printed on paper without watermark. 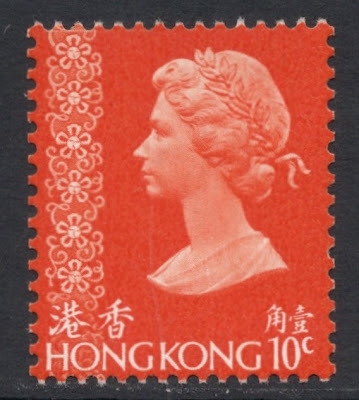 The same head was used again in 1982, but now in a design which became even more Asian than the previous one: a lion and a dragon supporting the Machin portrait. Nice touch is the subtle change of design for the high values, with the two beasties now only being outlined rather than fully coloured in. The high value is a 1991 reprint and is of the 'lighter shade on chin' variety. Hong Kong apparently just couldn't get enough of this particular Machin head, because it was used again for a new set of stamps introduced in 1987. This time it featured large above the Hong Kong skyline. Again, the high values were slightly different in that they showed different Hong Kong scenes at the bottom. Also, a number of reprints made for this set included the year of print, which makes for a good number of sub-sets to this set. 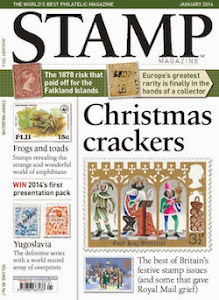 But even more interestingly, the stamps without year imprint exist in two versions: with light or heavy shading on the chin! For its final fling, Hong Kong finally introduced the 'proper' Machin head on its stamps in 1992, the last Elizabethan definitive set to be issued in Hong Kong. The set features in our regular 'Machin Thread' on our forum, which you'll find here. 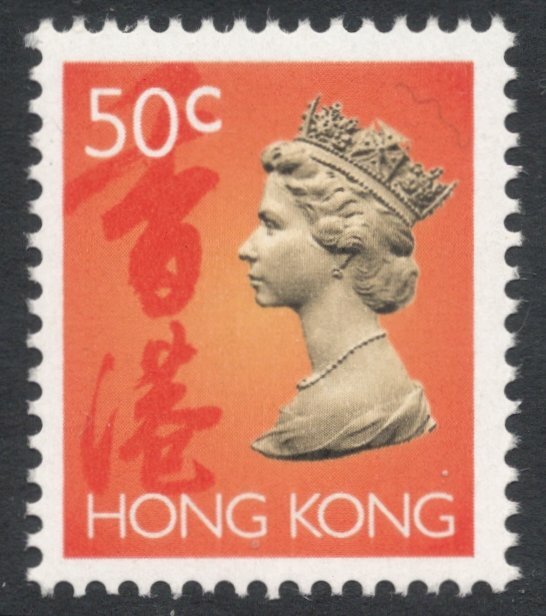 So you see, if you're looking for an original QEII collection, you can't go wrong with Hong Kong! Great post! 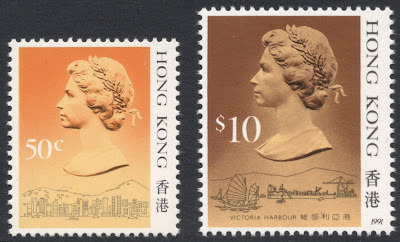 I really like the final set of Hong Kong definitives. The background colours and the Chinese writing down the side really make this set striking! Ta! And here's me thinking you would opt for the one with the dragon on! It was definitely a close one! !